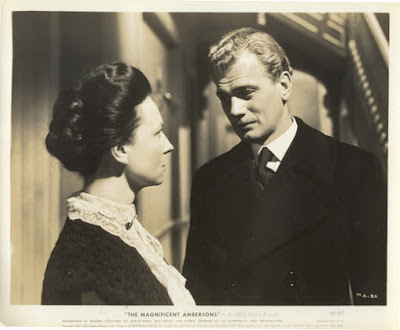 The magnificence of the Ambersons may have begun in 1873 but it looks like we may never get to see it in all its glory. Orson Welles's follow-up to Citizen Kane (1941), an opulent adaptation of Booth Tarkington's Nobel Prize-winning novel of 1918, was famously butchered by nervous executives at RKO when the director's back was turned - its editor Robert Wise instructed to shave over an hour of footage from Welles's final cut, burn the negatives and shoot a more optimistic ending after a lukewarm preview screening had given the suits the jitters and before Welles could return from the set of his unfinished It's All True in Brazil in time to intervene. Some say a complete reel of Welles' finished cut was sent to him for safe keeping in South America by loyal crew members but, if such a treasure ever existed, it has long since been given up as lost. However, after the amazing rediscovery of a longer cut of Fritz Lang's Metropolis (1927) in an Argentine storeroom in 2008, the possibility of an unadulterated Magnificent Ambersons turning up suddenly feels that little bit less remote. What we have left of Welles's lost masterpiece remains a spellbinding piece of cinema. This elegaic gem concerns a wealthy Midwestern dynasty living in splendour at the turn of the century before being brought low by the bull-headed arrogance and destructive snobbery of its heir, George Minifer Amberson (Tim Holt), who opposes his widowed mother Isabel's (Dolores Costello) last chance at happiness with the true love of her life, a nouveau riche automobile pioneer named Eugene Morgan (Joseph Cotten), whose fortune might have saved the Amberson estate from crumbling into nothing. George's oediapl jealousy and misguided preoccupation with protecting the family name from gossip and rumour leads him to sneer at Morgan's "horseless carriage", even though he himself is ostensibly in love with the man's spirited and devoted daughter Lucy (Anne Baxter). Anxiety over their feud eventually drives poor Isabel to an early grave and Eugene away to grieve while the Ambersons fall on hard times and are forced to exchange their gloomy mansion for labouring jobs, a cheap boarding house and a life of toil, destitution and quiet desperation. Welles was introduced to Tarkington's novel by his father Richard Hodgdon Head Welles, who was a close friend of the author and may even have inspired the character of Eugene, having made his name with the invention of a best-selling range of bicycle headlamps and married a society beauty, one Beatrice Ives, an accomplished concert pianist. Orson was actually the director's middle name, incidentally. His Christian name was George. The young Welles became fascinated by a novel with such close ties to his own childhood and produced a version for his radio series The Campbell Playhouse in 1939, in which he took the role of George himself but in which only Ray Collins appeared from the later cast. 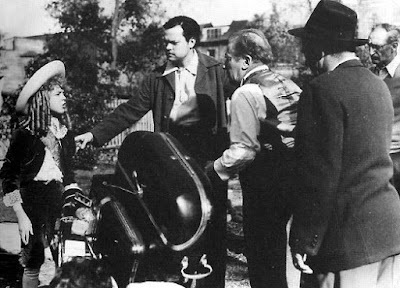 By the time the director came to shoot a film of The Magnificent Ambersons in the wake of his critical triumph with Kane, Welles decided that he was too old and had become too portly for the central role so instead cast Tim Holt as George, a performer he considered, "one of the most interesting actors there's ever been in American movies" but whom he felt squandered his talent by taking easy, minor roles in Hollywood Westerns. Welles doesn't appear on screen but his pitying, murmurous narration reverberates around the halls and haunts proceedings superbly, his presence always felt. Cotten, the redoubtable Agnes Moorehead and composer Bernard Herrmann were all Mercury Theater veterans while Anne Baxter was handed a role because she knew something herself of living with a legacy, being the granddaughter of famed architect Frank Lloyd Wright. The stately Amberson house was built in full on a studio sound-stage - parts of it reused in countless films since - with the idea that its walls could be removed so that Stanley Cortez's camera could roam freely around the place like a character in its own right. This effect is noticeable in the scene in which George confronts his Uncle Jack (Collins) soaking in the bathtub, swapping glances from each man's perspective and catching their reflections in the mirror and also in the scene in which the bullied Aunt Fanny (Moorehead) appears at the top of the third tier of bannisters, eavesdropping on the arguments below. Like Kane, The Magnificent Ambersons presents a personal empire tearing itself apart with hubris and resentment and demonstrates the powerlessness of humanity and all its impermanent trinkets and monuments to withstand the ravages of time, recalling the "Colossal Wreck" of Ozymandias in Percy Shelley's poem of 1818. The Magnificent Ambersons is arguably a more mature, disciplined work than its celebrated predecessor, however, taking the bold decision to centre itself around a protagonist so sour and unpleasant that he risks alienating the popcorn crowd from the get-go and capsizing the whole venture. No wonder the Philistines were spooked and chose to pair Ambersons in contemporary picture houses with the loopy Lupe Vélez vehicle Mexican Spitfire Sees A Ghost (1942). 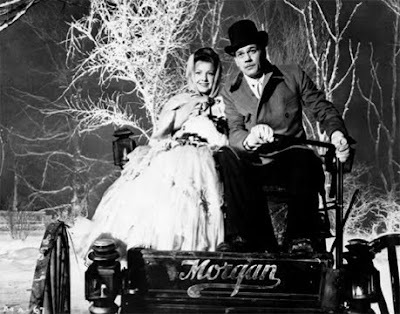 In a movie full of wonder, my favourite scene has to be the magical moment in which Morgan's shivering jalopy finally breaks down in deep snow, whereupon the merry inventor cranks it up gamely and keeps everybody cheerful by starting a sing-along to 'The Man Who Broke The Bank At Monte Carlo'. Everyone except George, that is. Cotten, Costello, Moorehead and Collins give memorable performances as a quartet of sad and kindly ghosts who have been so terribly wronged by their spoilt offspring. wonderful writeup. for some reason i start this film and i keep getting interrupted or losing it on the dvr, etc. i need to commit to it soon. love welles. Thanks very much Mr Jeffery. I certainly found the obnoxious George a very hard man to tolerate the first time I saw Ambersons but it's a film I keep coming back to. It's well worth your time.